Glucosamine Chondroitin MSM 120C Joint is based on the most tried and tested ingredients for joint health, such as glucosamine sulfate, chondroitin sulfate, and methylsulfonylmethane. A simple formula, this product is aimed at making your joints become more flexible and healthier, so you can continue to enjoy a healthy lifestyle, without worrying too much that your joints will hurt each time you get involved in physical activities. The product comes at a cheap price, and it also has the key ingredients, so we had to check it to understand more about its formula and its benefits. What Does Glucosamine Chondroitin MSM 120C Joint Contain? As you can see, only the most important ingredients are included with this formula. Glucosamine sulfate was proven through a series of clinical tests to be a must have for any joint health supplement. Chondroitin sulfate and MSM are great enhancers of the effects provided by glucosamine sulfate, so they all support the joint function overall. However, since the product does not contain hyaluronic acid, or herbal remedies, we doubt that it is the most efficient on the market right now. The recommended dosage for Glucosamine Chondroitin MSM 120C Joint Supplement is two tablets twice daily that you can take with food or no food. A bottle of Glucosamine Chondroitin MSM 120C Joint Supplement with 120 capsules, or the supply for one month, costs 25.99USD. We could not find any clear reference to a money back guarantee on the manufacturer’s website. The supplement is sold through resellers, so this may be an issue that must be handled by them, as well. Anyway, you can always contact the company if you find something wrong with your purchase. Glucosamine, chondroitin and MSM are the key ingredients that any health supplement that claim to help joint function should have. 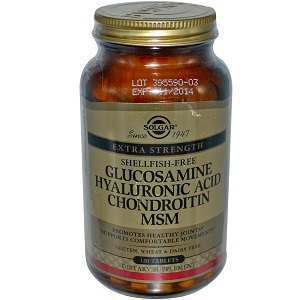 Glucosamine Chondroitin MSM 120C Joint has all three of them, but, unfortunately, nothing else. This means that the formula reviewed here is not the most potent, so you may want to shop around for an alternative. Mark Stevens	reviewed Glucosamine Chondroitin MSM 120C Joint	on November 7th	 and gave it a rating of 2.